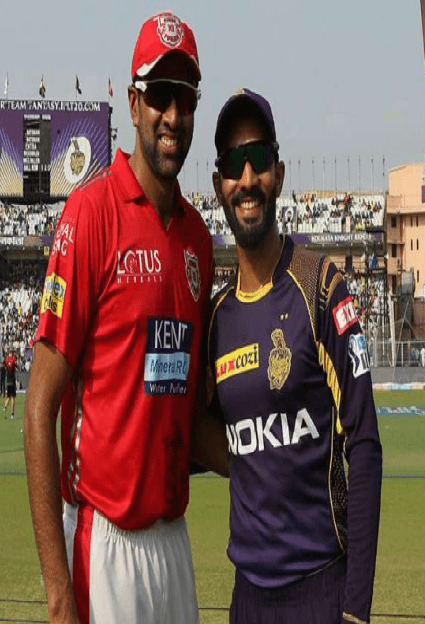 The Kolkata Knight Riders and the Kings XI Punjab are both coming off victories, but both teams will know that they had won a games which the opposition dominated for most parts and had just about managed to sneak through to a victory. The Kolkata Knight Riders had a blinder from Andre Russell which helped them win, while the Kings XI Punjab had a controversial Mankading incident after which things went their way. These are not things that will happen every day and hence both teams will be looking to secure another win to feel more confident. These two teams have faced each other in 23 matches, out of which the Kolkata Knight Riders have won 15 matches and the Kings XI Punjab have 8 victories. At Kolkata, the Knight Riders have won 7 out of the 10 games played. Hence, the Knight riders have clearly had the upper hand against the Kings XI Punjab. Dinesh Karthik, for the Kolkata Knight Riders will be a key player against Punjab. He had a great season last year for the Knight Riders scoring 498 runs with a strike rate of 147.77. Punjab’s strength in their bowling are the spinners with likes of Ashwin, Mujeeb Ur-Rahman and possible Varun Chakravarthy, and Dinesh Karthik is one of the best players to counter the spin effectively. Chris Gayle, for the Kings XI Punjab has been in great form in recent times. He has got off to a great start in this year’s IPL scoring 79 off 47 balls against the Rajasthan Royals. Gayle has the tendency to string together good performances when in form and Punjab will be hoping for more runs from him. Gayle also has a very good record against the Knight Riders scoring 615 runs at an average of 51.25 and a strike rate of 152.22. The Kolkata Knight Riders will most probably play with the same team, unless Narine is not fit to play this game, in which case they can either go with Joe Denly who provides a good batting option at the top of the order along with some handy spin bowling option, or could go with Carlos Brathwaite, for the extra pace option, who is also good finisher down the order. With Miller coming back into the squad, Punjab will want to play him straight away. They could possibly be looking to leave out Sam Curran and bring in Andrew Tye to strengthen the bowling. The pitch at Kolkata has always assisted bowlers when they hit the right spots, but has often produced high scoring game. We can expect another 170-185 runs game at the Eden Gardens. The Kolkata Knight Riders will start favorites given their record and the balance of the team. For Punjab to have a chance, they will once again need Gayle or Rahul to get a big score. The Kolkata Knight riders will be should look to get KL Rahul and Chris Gayle very early in the innings. For Gayle, they should be looking to use Lockie Ferguson or Andre Russell straight away and should look at bowling full and straight at the stumps, mixing it up with the occasional short ball. In his last 6 innings prior to this IPL, he has been bowled 4 times. Even in the other two innings, he has got out to full pitched delivers. KL Rahul can tend to be a bit loose outside his off stump and hence the pacers should look at swinging it away from him early on. The Kings XI Punjab should look at targeting the spinners who the Knight Riders heavily rely on and hence taking them out of the game can put them in trouble. They should also plan for Andre Russell with someone like Mujeeb Ur Rahman who has a number of different variations and can be difficult to pick or Varun Chakravarthy who will be a bit of a mystery and hence will take time to get used to.